Having done projects around the house for years and having a curious mind there are a lot of things I can do for people they just do not have the time to do or want to do. Cleaning Gutters No Project too TouchyHonest answers to the question from a customer about can you do this type of project in this situation is what is key to success. As my dentist said "It is a question of knowing what dentistry you do well and if there should be a problem know how to fix it" Pretty simple business plan. The great part of it is the variety and amount of different situations and still many things to learn. Credit also has to go to Pat D'Amato of Spring Glen Hair Cutters for telling me to start the business. "If you have a ladder, do not mind heights people will use your service". He was right. He can be contacted at 203-248-4283 for all your consulting needs and hair cuts. With the right tools and equipment we apply the right type of materials the rgiht way. One example is the x-jet nozzle we use for power washing. 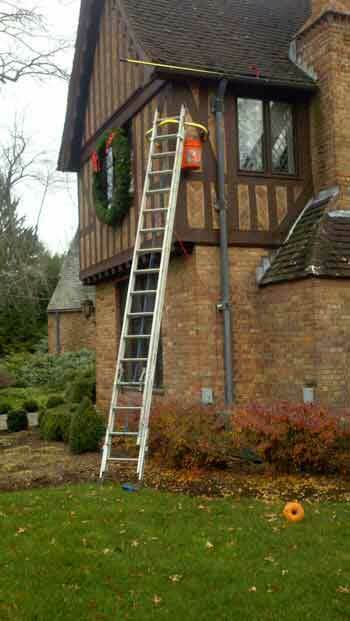 It mixes the soap solution and sprays it high up on the house so ladder work is minimal. With the turn of a lever a clear rinse can be applied to the surrounding vegetation.